A Precision Drone aircraft hovers above the ground at the 2014 Precision Aerial Ag Show in Decatur, Ill. More than 1,000 farmers and enthusiasts attended the show, which demonstrated how growers can use drones on their farm. Rather than a field of dreams, it looks like the future of farms is a field of drones. Experts predict that the agriculture industry may soon account for roughly half of all drone flights in the United States. As part of that trend, farmers from across the country gathered in central Illinois this week for the Precision Aerial Ag Show, a showcase of unmanned aerial vehicles, otherwise known as drones. 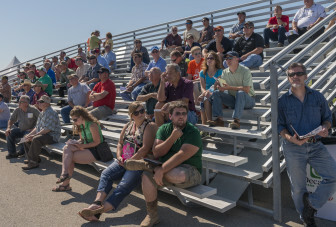 A large crowd watches demonstration flights at the 2014 Precision Aerial Ag Show in Decatur, Ill.
Stu Ellis, the event’s organizer, said people from more than 30 states and at least six foreign countries came to the two-day show in Decatur. Organizers estimated attendance totaled more than 1,000. “The turnout today shows a great interest of farmers trying to advance the technology on their farms to make it more efficient,” Ellis said on Wednesday. This reflects the growing popularity of drone use in farming, a practice becoming standard as farmers seek more efficient ways to survey their fields and evaluate plant health. Read also: "States restrict drone use because of privacy concerns"
A Department of Transportation Office of Inspector General audit released last month reported that there will be about 7,500 active unmanned aircraft systems flying throughout U.S. skies within the next five years. Randy Aberle farms corn, wheat and soybeans in Gibson City, Ill. 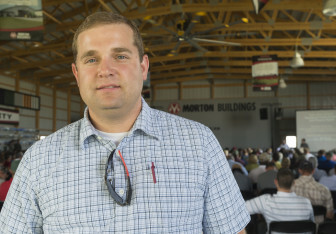 He spoke on a panel of farmers at the 2014 Precision Aerial Ag Show. Randy Aberle grows corn, soybean and wheat in Gibson City, Ill. Aberle said he has long been flying drones above his farming operation for a variety of tasks. Judi Graff, who farms corn, beans, wheat and cattle in Middletown, Ill., also uses drones. Graff said that drones are worth any costly investment they may require because the aircrafts reassure farmers they are keeping up with what is going in their fields through the information they collect. For example, by using a drone, she said, farmers could quickly evaluate whether there are problem areas in their fields. A drone can cost anywhere from about $300 to more than $150,000. Despite the growing enthusiasm demonstrated by the farmers and drone hobbyists in attendance, drone advocates familiar with Federal Aviation Administration rules argue that regulation is currently murky and often restrictive. During a session on the legalities of drone use, attorney Brendan Schulman of Unmanned Aircraft Systems law group pointed out contradictions in airspace regulation. Other speakers included Rory Paul of Volt Aerial Robotics. In general, hobbyists using drones for strictly domestic, non-commercial purposes are allowed to pilot their drone below 400 feet, according to the current aviation administration national policy. Commercial use of drones, on the other hand, is prohibited without direct authorization from the aviation administration at any altitude. Additionally, even if commercial users are cleared to fly drones, operators must be able to see the drone at all times. Those commercial rules are contradictory, according to Brendan Shulman, head of Unmanned Aircraft Systems law group, a branch of Kramer Levin Naftalis & Frankel LLP, which has offices in New York, California and Paris. 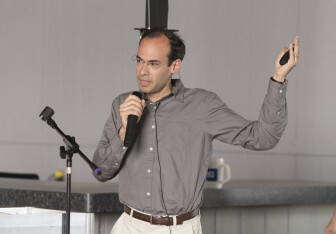 Shulman said there should not be any difference between putting up a windmill or flagpole on private property and flying a drone in the same airspace. Furthermore, about half of all U.S. states – including the Midwestern states of Illinois, Indiana, Iowa, Wisconsin and Minnesota – have some form of a privacy law that restricts drone use, an American Civil Liberties Union analysis found. Illinois specifically has a privacy-protection law that guards against drone surveillance. A drone, otherwise known as an unmanned aerial vehicle or unmanned aerial system, from the Crop Copter company at the 2014 Precision Aerial Ag Show in Decatur, Ill. A hobbyist-level drones can be as cheap as $250 dollars, while a top-of-the-line commercial drone can cost more than $100,000. Read: FAA statement on drones in agriculture Using UAS (unmanned aerial systems) for precision agriculture falls under two categories: application of fertilizer or pesticides and crop monitoring. Work is underway to implement the provisions of Section 333 of the FAA Modernization and Reform Act of 2012 to move forward with incremental UAS integration. This section of the Act may only be applied to specific, limited, low-risk uses in advance of the small UAS rule. The FAA is still evaluating this option. Companies from four industries have approached the FAA and are considering filing exemption requests which would begin the process. These industries include precision agriculture, film making, power line and pipe line inspection, and oil and gas flare stack inspection. Recent policy efforts suggest that new federal guidelines may further restrict drone use specifically related to agriculture, as well. The policy is under a period of public comment until July 25. 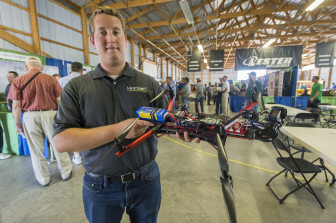 Steve Petrotto, brand manager of Horizon Precision, holds a drone at the 2014 Precision Aerial Ag Show in Decatur, Ill.
“The FAA has been relatively clear, but, at the same time, unclear for what we have to do to become skillfully certified,” he added. Stephen Morris, an authority on drone design and president of the California-based MLB Company, echoed similar ideas. Morris said he once viewed the agriculture industry as a promising market. Now, he said the restrictive policies have led him to focus on other markets. 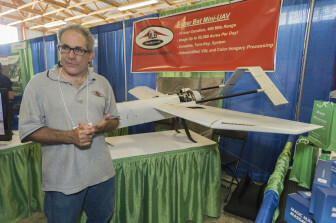 During the show, Morris showcased his company’s Super Bat UAV. At a cost of $150,000, this high-end drone model that can fly thousands of feet in the air and survey up to 55,000 acres in a single day. “We see agriculture as a big potential market,” Morris said. “Unfortunately, we think it’s going to be other countries that develop this first because of severe regulations in the United States. Stephen Morris, president of MLB Company, stands next to the Super Bat UAS at the 2014 Precision Aerial Ag Show in Decatur, Ill. The Super Bat UAS can reach altitudes of 10,000 feet and survey 55,000 acres of crops in one day. Besides concerns with commercial use and privacy, critics have also pointed out that increased drone use presents safety challenges. For instance, the Department of Transportation audit stated that the aviation administration is “significantly behind” schedule in meeting provisions of the FAA Modernization and Reform Act of 2012, including goals related to achieving safe integration. The Washington Post recently obtained military statistics that revealed numerous military drone crashes and near misses in air space. The investigation found 418 major crashes involving U.S. military drones from September 2001 through 2013. “You can do a lot of damage really fast, whether that’s to property, yourself or someone else,” Aberle said. A hobbyist-level vehicle from Horizon Precision is flown at the Precision Aerial Ag Show in Decatur, Ill. 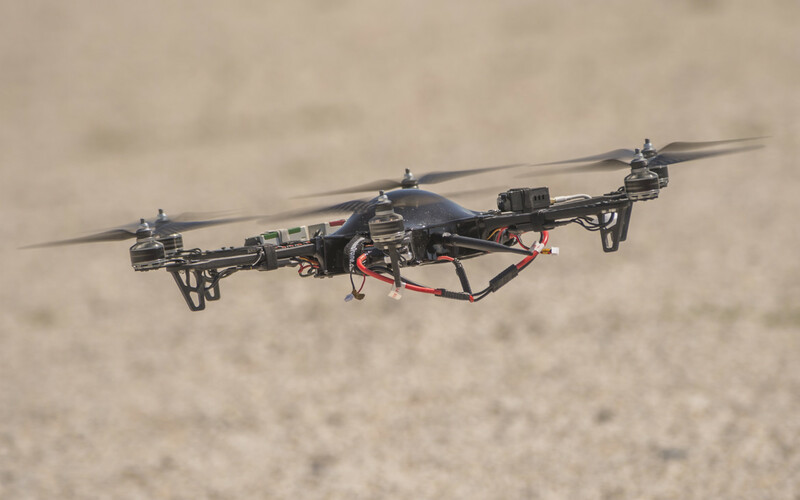 Under current federal policy, hobbyists can fly drones at altitudes below 400 feet. Stu Ellis helped organize the 2014 Precision Aerial Ag Show. “The turnout today shows a great interest of farmers trying to advance the technology on their farms to make it more efficient,” Ellis said on the show's kickoff day. The large Dragonfly Pictures unmanned aerial vehicle allows for a spray attachment. 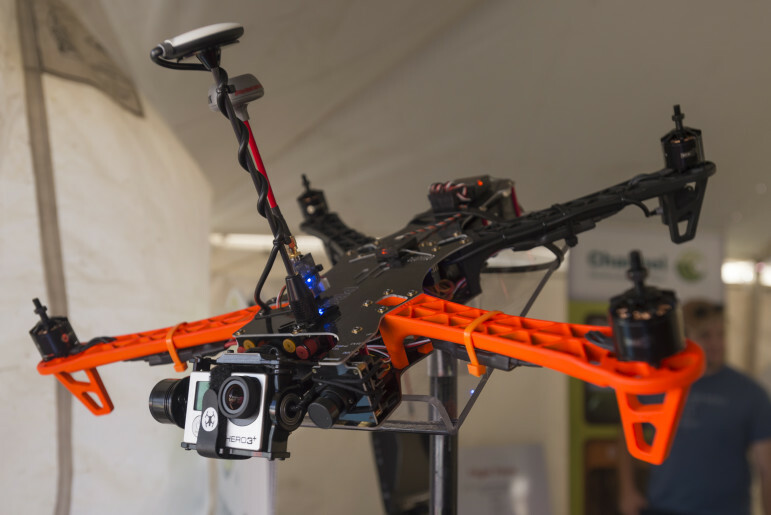 The Dragonfly was one of the largest drones at the 2014 Precision Aerial Ag Show. Tom King of Crop Copter talks about the company's vehicle selections at the 2014 Precision Aerial Ag Show. A hobbyist-grade drone can cost less than $300 in some cases. High-end drones, in contrast, can cost more than $100,000.